Resident #2 – began by asking whether the ‘new council is doing all it can to ensure it has all the information’ to ‘bolster its position at VCAT?’. Said he had been an objector to VCAT several times and ‘last week’ attended the hearing for a development on Neerim Road, Carnegie. Went on to say that it ‘breaks his heart’ to see council representatives trying to ‘argue a case’ when they don’t have ‘much to stand on’. Gave the example of internal amenity where the developers argued that it is ‘not mentioned in the planning scheme’. On car parking there were many permits granted where waivers were granted but ‘there is no evidence of how many car parking waivers have been granted’. Went on to say that ‘unless there is other evidence provided’, then the ‘evidence of the applicant stands’. Stated that the member asked about the draft Amendment on height limits, but the council rep ‘wasn’t able to provide an update on that’. The speaker claimed that this ‘would have had a big impact on the outcome of the case’. The question then is whether they can ‘invite’ these people who ‘act for council’ to present to council a report on ‘what are the gaps’ ‘whilst the whole process’ of implementing the work plan for the planning scheme review is going on. Also asked how council can ‘accelerate’ the Minister’s approval of the draft amendments. DELAHUNTY: said that council were doing the ‘strategic work’ that she thought would ‘bolster’ council’s position at VCAT. Also stated that ‘arguably’ this strategic work should have ‘been done some time ago’ but they’ve ‘made the decision to do it now’. Thought that the questioner’s point about council reps reporting back to councillors ‘might have some merit’. TORRES: said it wasn’t an ‘easy’ situation and that council gets a ‘high number of VCAT appeals’ and ‘many’ that council ‘defends’ are changed or ‘overturned by VCAT’. 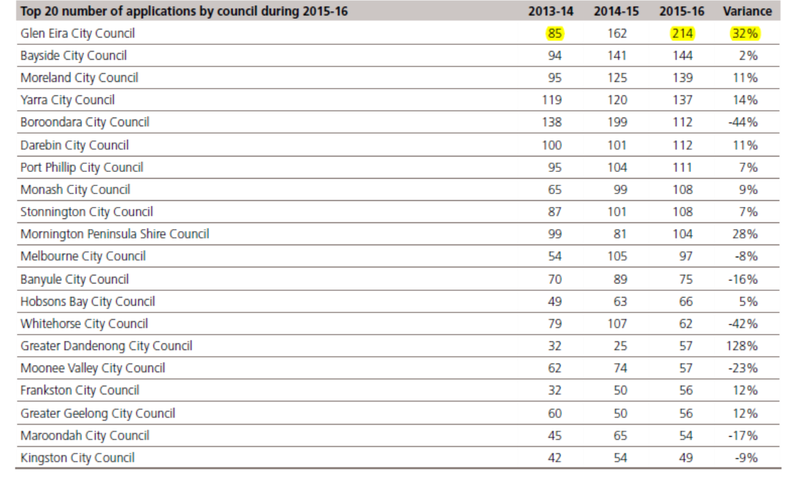 Claimed that ‘council is running’ on an average with ‘other similar councils’. Stated that the VCAT reps include ‘senior staff’ and consultants who were chosen because of their ‘experience and expertise’ including one who was previously a VCAT member himself. DELAHUNTY: repeated the question that they use the reps to ‘figure out what are the hot issues at the time’ and that this ‘suggestion’ has ‘merit’. Informed the gallery that the VCAT Annual Report has been published and that there was ‘some discussion’ about the number of Glen Eira appeals. Admitted that it was a ‘high number’ and the cost for ratepayers. Again thought questioner was right in that they had to listen to reps ‘in order to figure things out’. QUESTIONER #2: said there was ‘urgency’ because there’s a ‘gap’ between ‘what the representatives have to argue’ and they could be the ‘best representatives’ but ‘if there’s no basis for their arguments’ and therefore ‘no results’. SILVER: said he was ‘satisfied’ that officers are ‘taking the appropriate steps to incorporate our policies’ into the planning scheme and that there’s a difference between ‘policies’ and the current legislation. Said he would like to see more lawyers on the panels. Readers should find the following statistics from the VCAT Annual Report very interesting. Not only do they reveal that Glen Eira has had the highest number of appeals to VCAT in the last year, but that East Bentleigh appeals have gone through the roof (a 90% increase). These statistics put pay to the myth that under the new zones, VCAT appeals would be reduced. It also reveals the impact the zones have had in East Bentleigh where the overwhelming majority of cases are developer initiated precisely because of the zoning! That East Bentleigh statistic is both insane and sad. The true impact of the zones will really hit home here in 2017. I believe around 250 apartments barely 200 metres apart are already approved and due to be built. Are the 250 you’re talking about mainly on centre road or the side streets? Mainly Centre / East Boundary but some have slipped through just outside the commercial area. In a public forum, it is very poor that Mr Torres is unable to provide an accurate summary of the facts. Firstly, Glen Eira is clearly not running on average with other Councils and secondly one of the main reasons is the lack of planning controls. By making these comments Mr Torres is indicating that he part of the problem and not the solution. Hopefully the new Council leaders explained this to him after the meeting. The questions asked by the resident are very good. The answers provided by Delahunty and Torres are the opposite. I am not surprised that council has had the highest number of appeals to vcat and that’s because vcat has been used as an excuse over and over again. Instead of addressing the holes in the planning scheme councillors have done nothing to change it except to keep blaming vcat for everything. Now we get the admission that maybe council should have done some strategic work earlier. Well as far as I’m concerned Delahunty was one of those councillors who okayed the zones without consultation and has been sitting there for four years and achieved nothing in changing the planning scheme. Now we’re supposed to be happy to wait another decade before they get around to looking at structure plans for the neighbourhood centres like East Bentleigh. On the point about getting the vcat people to report back to council on the gaps and saying this idea has “merit” is another unbelievable admission of how terrible planning is in Glen Eira. The onus is on the planning department to look at every vcat decision and to report on it on a regular basis. What did the vcat member overrule and why and how can we fix this? That’s the sort of work I would expect any decent council to be doing on a regular basis and what has never been done by council. We are now going to have some strategic work done when it’s far too late. Maybe residents can be told exactly what this means, how long it will take, how much it will cost, what will be the extent of community input and so on. Many questions and no answers. Carnegie’s drop in appeals is probably due to the fact that all of the growth zones have already been plundered. Neerim, Belsize, Elliott, Tranmere and others. Not too much left. Thanks to the excessive waivers in Carnwegie the shopping strip is finished for good frash meat, only one butchers left and supermarkets are killing primary producers. They work like slaves for little return. Hope councillors wave me goodby as I DRIVE OFF TO Boroondarra or Monash. This is not a surprise as when I OBJE3CTED TO THE ONE OF THE LAST APPLICATIONS FOR A 100 SEAT RESTUARANT AND 8 STAFFERS ITHE APPLICATION WAS GIVEN THE FGREEN LIGHT. This was the 36 reswtaurant in the Neerim Road to railLWAY section and council suggested I catch a bus or ride my bicycle to purchase my week’s shopping. The figures are very very informative. 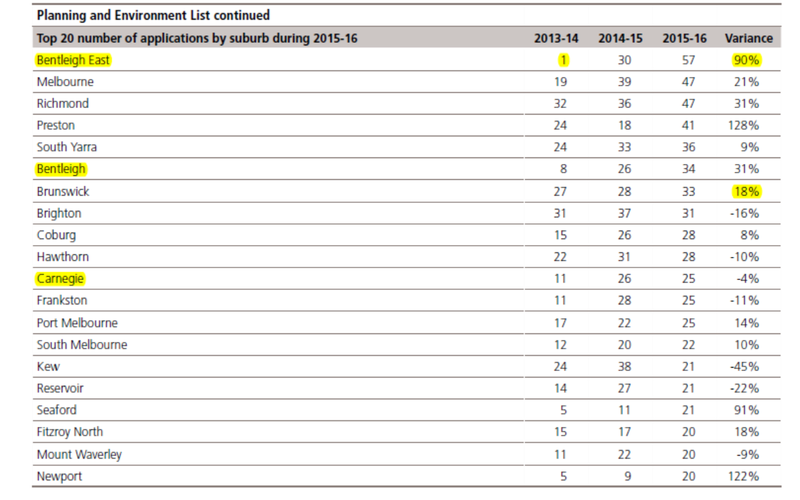 Since the zones in 2013/14 came in Glen Eira’s appeals have nearly tripled. Other councils who took the year to plan properly have nowhere near these results and about 7 have numbers that are in decline. Developers eyes must have lit up in August 2013 when they saw what a woeful job was being done and how they were literally being handed the keys to the city.